Background: Recently, single-site laparoscopic surgery is widespread, especially for cholecystectomy, oophorectomy and appendectomy. But suturing and ligation are very difficult to perform in single-site laparoscopic surgery. There we report a new ligation technique for single-site laparoscopic surgery. Method: We performed eight cases of single-site laparoscopic transabdominal preperitoneal (TAPP) hernia repair, using a so-called parallel method with a conventional surgical instrument. The operation was done by the conventional TAPP method with MicroVal® mesh. The peritoneum was closed with an intracorporeal running suture. We used a new “wall-touch technique” to tie the thread. The suture thread is fixed by letting the forceps contact the wall. We can also prevent a suture from sliding down. Results: The procedure was technically successful without placement of additional trocars. Suturing and ligation of the peritoneum were possible in all cases. Mean operative time was 100 minutes. No intraoperative or postoperative complications were observed. Postoperative hospitalization was 3.9 days. Conclusion: Ligation is possible but very difficult. 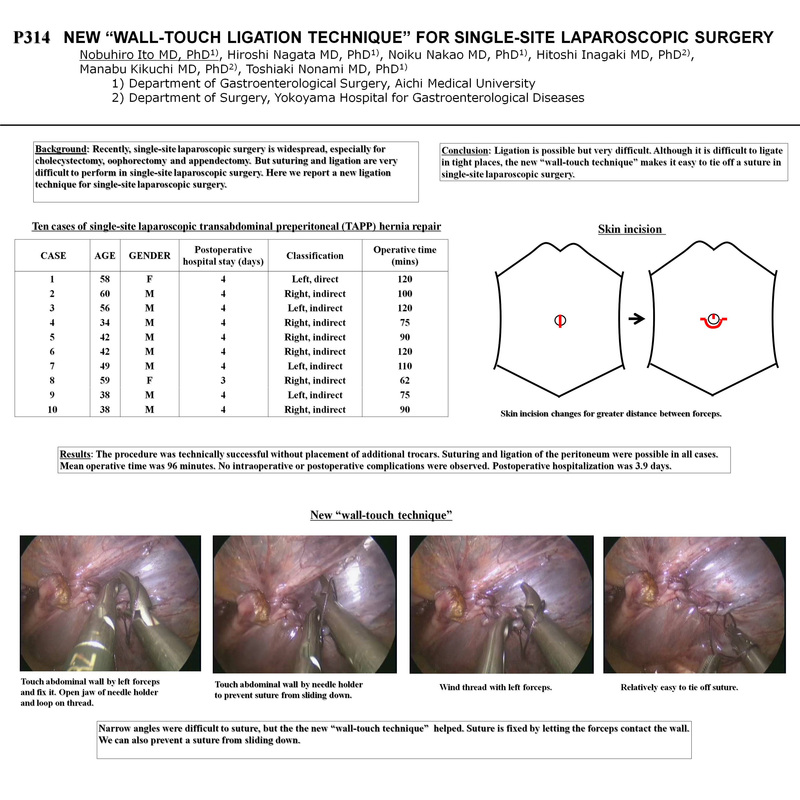 Although it is difficult to ligate in tight places, the new “wall-touch technique” makes it easy to tie a suture in single-site laparoscopic surgery.